TORONTO -- Toronto’s Bike Month has evolved from a single Bike to Work Day in 1998 to become one of the largest events of its kind in the country. Bike Month is organized by the City of Toronto and the Cycle Toronto (formerly Toronto Cyclists Union). Below are a just a couple of events dandy will be at, but check out their calendar for full event listings. In Toronto, Bike Month kicks off with the Toronto Group Commute on May 28. Commuters from across the city meet to ride together from various start points, eventually converging at Yonge and Bloor Streets for 7:30 a.m. From there, cyclists will ride over to Nathan Philips Square for 8 a.m. to enjoy a free pancake breakfast and a free Bike Month t-shirt. (There are plenty of free flapjack events all month). On June 2, Evergreen Brick Works will be doling out pancakes from 8 a.m. to 12 p.m. and on June 6, the Hart House at the University of Toronto will be serving breakfast from 7:30 a.m. to 9 a.m.
On June 23, from 11 a.m. and 5:30 p.m., head over to the Distillery District for Mountain Equipment Co-Op’s Bikefest. A completely free event, Bikefest offers dozens of bike clinics and seminars, free basic bike repair and tune-ups, a bike swap, live bands and city cruise bike rides. -- From May 27 to June 3, Montreal celebrates cycling with Bike Fest, an annual event where thousands of cyclists happily take over Montreal’s busy streets. - The Tour de l’Île de Montréal, which was first held in 1985, is a famous 50-kilometer bike ride that brings out over 25,000 cyclists of all ages. - Beginning at dusk, costumed cyclists pedal 22-kilometers throughout Montreal for the Tour la Nuit, a truly ethereal nocturnal ride. - The Metropolitan Challenge ride is a scenic experience with valleys, vineyards, orchards and sugar bushes as the backdrop. Four distance choices and various start times mean this is an ideal ride for cyclists of all skill levels. HALIFAX -- Halifax packs all of its bikey events in one outstanding week, including some of these highlights. The week begins on May 25 with a kick off party at Sands at Salter on the Halifax waterfront. Along with bike-themed entertainment, tricycle races and bike tube changing competitions, the Halifax Cycling Coalition will be presenting the Halifax Cycling Awards, which recognize individuals and organizations who encourage cycling in the city. Check out the Bike Week Gallery Hop for velo-friendly art exhibits. On May 26, a group, leisurely ride will take place along the Salt Marsh Trail, which is a part of the Trans Canada Trail. The ride will include information stations along the four-kilometer route with refreshments and snacks provided. Cyclists should meet at 806 Bissett Rd., Cole Harbour, at 11 a.m.
Halifax’s second annual tweed ride and picnic starts at 12:30 p.m. at I Heart Bikes at 1325 Lower Water St. Don your newsboy hat, knickers, corsets, pantaloons and other 1900s garb for a relaxing ride through the city. EDMONTON -- Celebrating its seventh year, Edmonton’s bike month is chock full of bikey events, including velo movie nights, group breakfasts and the bikeology festival, a one-day bike appreciation extravaganza. Monday Night Movies at the Metro is back again. Every Monday, head over to the new Metro space on 109 Street to watch a velo-oriented movie for free. Start time is 7 p.m.
Each and every Friday in June, between 7 a.m. and 9 a.m., enjoy a Bikey Breakfast at various eateries throughout the city. Now in its 10th year, the Bikeology Festival will take place on June 16th, from 12 p.m. to 4 p.m at Beaver Hills House Park. 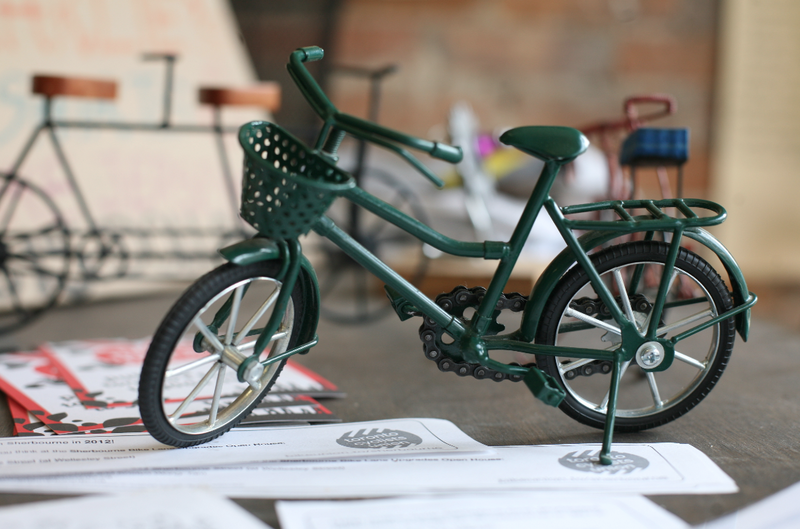 Get ready for spoken word musings about the bicycle, a craft table where you can make your own bike bling, delicious smoothies made from pedal power, lots of bikey games, and of course, free mechanic tune-ups. VANCOUVER, SURREY, BURNABY -- Bike to Work Week takes place during the first week of Bike Month. Guided group rides called You Can Ride Here take you to different districts of the city, including Hastings Sunrise and Dunbar. Vancouver hosts Velopalooza, a two-week festival from June 15 to July 2 that encompasses group rides, bike-oriented conferences and workshops, a huge parade to show off your one-of-a-kind wheels, and even bike bowling, an activity where participants hurtle down a hill on two wheels into stacked garbage cans – sounds enticing, no? Keep checking on bike month events in your community and look for dandy coverage of the ones you miss. ALSO: stay tuned to dandyhorsemagazine.com for news on the dandyhorse youth and employment-themed issue, launching in June!